It’s been pretty busy around here since our last update. Like, busy-busy. Wicked busy, even. But, now we’re taking a breather because we’ve got some great news to celebrate: beta has been released. Beta! It’s out! 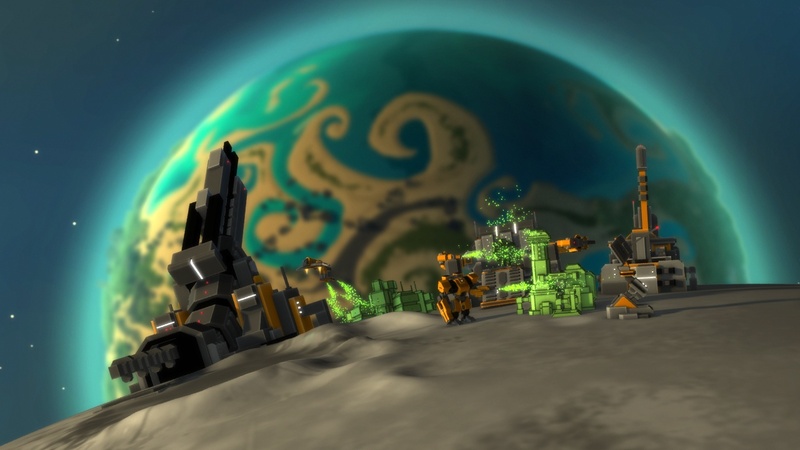 If you’ve pledged to receive the beta, you should be receiving an e-mail soon detailing how to get the game client and what to expect from Planetary Annihilation in its current form. For those of you in the alpha already, you’ll receive the beta just by updating the client. Enjoy strapping rockets to asteroids and sending them on a crash course into the planets. Enjoy orbital weapons and surveillance. Enjoy launching tanks, bots, and other vehicles onto celestial bodies. Enjoy waging war on an interplanetary scale. Ah, to be a fly on the wall at Uber Entertainment the last few weeks. We were crunching super hard on delivering beta, bashing out line after line of code and build after build. At one point, we generated over one thousand check-ins since the last alpha update. That’s a lot of check-ins! And it was a lot in a super short time, too. But, that’s the great thing about Uber: we’ve got a load of incredibly talented, inspired, and dedicated folks eager to rock and roll. Despite the long days everyone has been coming into the office fresh and ready to tackle new features and even a few problems along the way. This was an awesome experience to have, by the way, because we got to do it for you -- all of our backers and fans. Without you this dream of a game wouldn’t exist. Thanks for all the kind words, the support, the pledges, the questions, and the comments. You guys rule. There are a lot of you who pledged strictly for the beta. We'd like to take a second and welcome you to Planetary Annihilation. Blow up some planets! Have fun! Also, as we noted in the backer e-mail, do keep in mind that beta is beta; PA is a living, breathing game in development. It’s not “final.” Your experience will improve and change as we push out numerous optimizations, tweaks, and features. Your input is very important to us, which is why we're rolling out the game in beta. If you have a comment or question or noticed a bug, swing by the PA message boards. We’re good at answering questions in there. Our community is also extremely helpful, too. Folks like SXX, Raevn, Cola Colin, ZaphodX, The Wrong Cat, knight, TheTrophySystem, and many others are great at giving folks a hand when they need it. If you have a technical-related problem, or if you didn’t get your key, feel free to contact support. The e-mail for it is: support@uberent.com. Also, take a look at our FAQ to see if we’ve got an answer for your specific issues already. So, what’s next? We’ll continue to make your experience as best as possible. Also, Galactic War, in-game community-related features, better modding support, and a mod marketplace are all on deck. And, actually, if you’re into modding, swing by our modding board right now -- it’s full of great creators. Anyway, what are you waiting for? Load up the client and get moving, Founding Commanders -- these planets aren't going to annihilate themselves. Have fun! dexter chow likes this update. Are we supposed to get our beta key soon? Umm, I'm fine playing GTA V right now but yeah no key here. I pledged for the full game, I was wondering since we're now a fair way past “Estimated delivery: Jul 2013” is there a new estimate for the finished game or do you have plans to let backers in earlier (some kind of late beta) since we've missed the mark. Should all of the beta emails be out by now? I don't have mine, but I don't want to waste the team's time contacting support if they're still processing. I tried the 'FindMyPledge' link and it said no pledge found. I did pledge $40. Guess I will email support. I've still not received the beta key. I have also put a ticket in with support. It seems i used facebook to fund the project but that email is super dead. I just changed it now. Do I need to do anything else? Thx! So I emailed you guys 5 hours ago, and I have not got anything back. Is it possible just to try and re-send the email to me? It is annoying that I cannot play something which I have paid for since a year ago. Logan and Paul both, if you're unable to get access, please email support at uberent. Paul in particular, make sure you're logging in with your account, not your email address. Your email address cannot act as your login ID. Even after resetting my password, I'm not able to log into my UberNet account. Who do I contact to resolve this? Is the reason I have yet to get my key because I logged and bought PA through my facebook? If you're logged into the website at store.uberent.com, you should see a "My Keys" link as well. Any keys you own that are ready for activation should be there. I'm in the same boat; I should have had four keys coming, one for me, three for friends. I've received an email from Ubernet for how to download the client, but no keys yet. I haven't received my beta email yet, but this trailer looks very good. Looking forward to some multiplayer action across solar systems. I got an email inviting me to the beta, but I didn't get the access key. Id this the same for everyone else? Still waiting... Any estimates on timing? I (nearly) skipped the alpha (for COH2), but now I think it is a good time to rejoin the game. The progress you have made was amazing to follow. Congratulations to everyone at Uber and keep it up! Anyway to get a steam key when already in the alpha/beta? I don't know if I am the only one, but when I try to open the .dmg on my mac, it says "disc image corruption" and cannot open. Is there a new file you can send me? The game looks awesome guys, so proud to have supported this project! Quickly Luke! What was the first letter of your e-mail? I got the email, but the link asks for an activation key, and I don't have a key. There isn't one under my ubernet account details, and I noticed that my contact email is @gmail.com, while my kickstarter contact email is @hotmail.com. I changed it, so now they are both @hotmail.com, if that's the issue, but I'm still waiting for my beta key. Curse my low alphabetical placement! Curse it! I'm using https://chrome.google.com/webstore/detail/auto-refresh-plus/oilipfekkmncanaajkapbpancpelijih (set to refresh every 5 seconds and notify me on change) and waiting for my Game Key Details page to update. Why i can't pay my upgrade on the UberStore with paypal? Please be patient, guys. It's 2:20PM local time, and keys have been being emailed out for 5 hours now. We're about half done. We're sorry they go out so slowly, but our mass mailing system has to go slow so as to help guarantee delivery and minimize chances of being tagged as spam. I do not have my key yet... not cool. To be honest I didn't mind when the game was sold cheaper on steam and all but the fact that I still do not have my key and yet everyone can purchase it on steam. This is annoying me a little bit. Hoping my email pops along soon then can't wait to get started ! FYI I just got the email with instructions on getting the Beta. Yours will come soon as well, I hope! Wait until you get an e-mail with instructions how to participate in the beta. You my try to look into your Uber Store account for the beta code. Maybe it is listet there before they send out the e-mail. I had beta tier; how do I get my key? Remember, beta is only for the $40 and up tiers. Just got my key. Ohhh yeah! Just started my day at work. Ohhh noooo!